Magento is currently among the top E-Commerce platforms out there and is being used actively by the largest retailers on the internet due to the many benefits it provides. Not only does it serve as a highly versatile, E-Commerce system, it is relatively simple to understand with an abundance of resources available for that purpose. Magento isn’t just another popular platform – it ranks as the most commonly deployed system by the top 1000 internet retail merchants out there. At the same time, its scalability allows it to be modified for even smaller stores, which has led to its fame even within the circle of small scale merchants. Magento can be customized just as the customer desires with its endless themes and modular architecture, which is a testament to its reliability and functionality. Getting Started – But Where? Since Magento is widely used and open source, there are many high-quality resources to start acquiring in-depth knowledge about the platform. The following resources serve as excellent guides for both novices and developers already familiar with Magento. Even though Magento was from the start an open source E-Commerce platform, there was no significant emphasis on documentation, so there were few quality resources as references for beginners. Despite this setback, it was highly popular and when Magento 2 was announced, documentation was emphasized to be part of the core qualities of the platform. Magento documentation, as a result, is a compilation of high-quality information regarding the platform which covers everything from basic to detailed information and tutorials of every major release, ranging from Enterprise and Cloud Enterprise to Community Editions. Whether the user is a simple merchant, developer or designer, the official documentation provides content beneficial for every category of Magento user. All data regarding the platform such as release notes, compatibility, third party licenses and such is compiled and available in PDF and HTML files for users to access. Whenever you have a query regarding Magento, you can visit the official Magento forums at magento.com and post it there. It also serves as an excellent spot to become part of the platforms community itself, which is comprised of beginners, everyday user and the developers. You can get to know Magento users from your country and interact with other users who utilize the software in their everyday business activities. Moreover, it is a vital resource for gathering the latest news and developments related to Magento. Some of these community members likely also use online training software to offer their own courses and one-on-one coaching services for learning Magento skills. In case you need customized courses tailored to suit your criteria, there are experts available who can deliver according to your requirements. Although the experts charge accordingly as per the criteria, it is important to remember that the courses they deliver have been developed by the most knowledgeable and informed professionals in the field. The courses can be tailored for a vast variety of users ranging from beginners, everyday users, merchants and front end designers to even senior developers and business analysts. The access to custom courses is also offered economically in a one year All Access option, which is very suitable if you wish to train teams for your business. Inchoo is a full-service E-Commerce agency which is among the top tier of Magento development and services. They also operate a reputable blog brimming with detailed information and tips on how to get the best out of Magento. Their blog is rated exceedingly for helpful content and boasts positive reviews and feedback, which demonstrated that generating high-quality content elevated your status within a community as an expert. The latest news and developments are always officially revealed at events such as conferences, which should not be missed if you wish to stay an active member of the community and updated about Magento. Future trends and releases are also unraveled at such events, along with information regarding the existing platform. 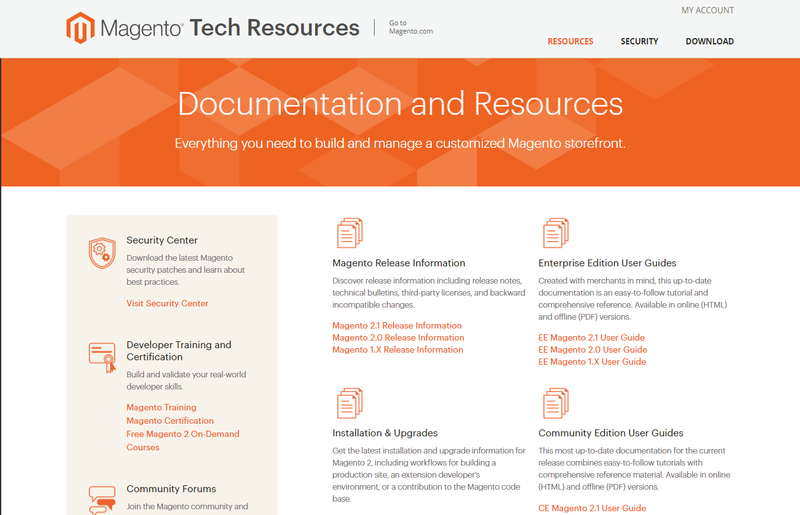 The official Magento documentation is the best way to get started, but the platform has evolved and grown to be complicated. This has presented instances in which more content is required to resolve queries, in which case Stackexchange serves as the perfect website for reference. The content is designed to be understandable for even those who are new to programming and there is even a dedicated Q&A service (magento.stackexchange.com) which caters to resolving Magento related issues that users encounter. Stackexchange rewards those who resolve queries that other users encounter, which promotes participants to submit quality solutions for problems. For the solution to be helpful, it is necessary that all the related data regarding the issue be submitted and the methods by which (if any) you tried to resolve by your own. Among the top Magento developers, it is impossible to forget Alan Storm, renowned Magento developer who founded Pulse Storm, which researches and develops innovative extensions for Magento and other Content Management Systems (CMS). His devotedness to the platform can be appreciated just by looking at his very own website which is loaded with helpful content which caters to almost every query imaginable. It serves as a helpful resource for both getting started with Magento and moving on to advanced concepts related to the software. Being open source, Magento has experienced immense development which has also led to quite a number of professionals in the field. These experts are more than happy to offer their services as well as veteran knowledge on the subject which offers unique information. Although the official documentation provides detailed information about the software, the experts have practical examples and real life scenarios which are relatable and easier to understand since they depict practical demonstration of concepts. Finding the right experts to take advice depends on what you are searching for and which solutions appeal to your understanding. Some of the renowned experts are Alan Kent, Ben Marks and many more. Magento is a vast open source E-Commerce platform which is open for anyone to venture in. By relying on these 8 resources as mentioned, you can easily get started on the software and begin your journey of learning the secrets of the trade towards mastering Magento. Simon Walker is an eCommerce developer and veteran business consultant with a combined experience of more than 7 years. He is currently working at FMEextensions – A Magento custom development company and a market leader in providing top quality extensions & themes. You can reach him through Google+ and Facebook.